How closely spaced are satellites at GEO? As the picture below (kind of) shows, there are lots of satellites in geostationary orbit. 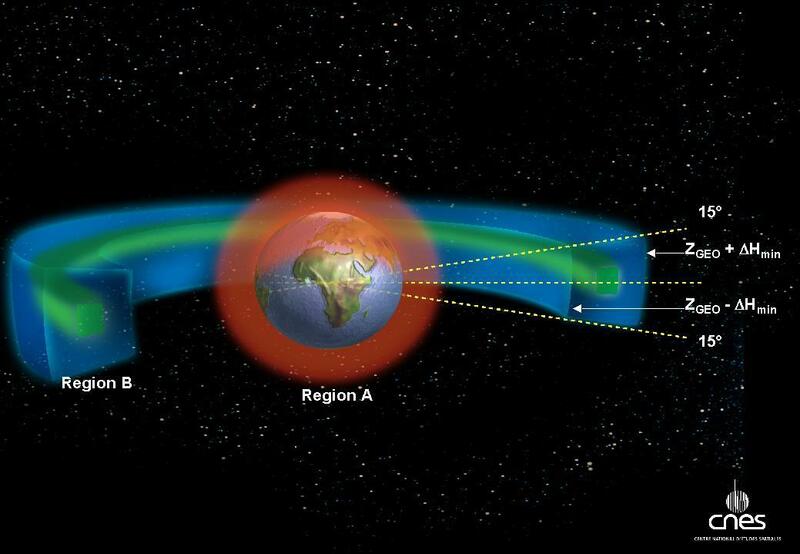 Couple this with the fact that certain longitudes are more desirable than others (like above North America or Europe, for example), and the question soon arises: how close do these satellites typically get? I would think that different operators would leave some (very) safe amount of distance between their spacecraft, but an operator with a fleet of satellites (like, say, Intelsat) might risk a much more closely-spaced cluster if they trusted their tracking data enough. So, what's standard practice with respect to spacing? Are there exceptions? Regarding proximity, we'll need a good database first. 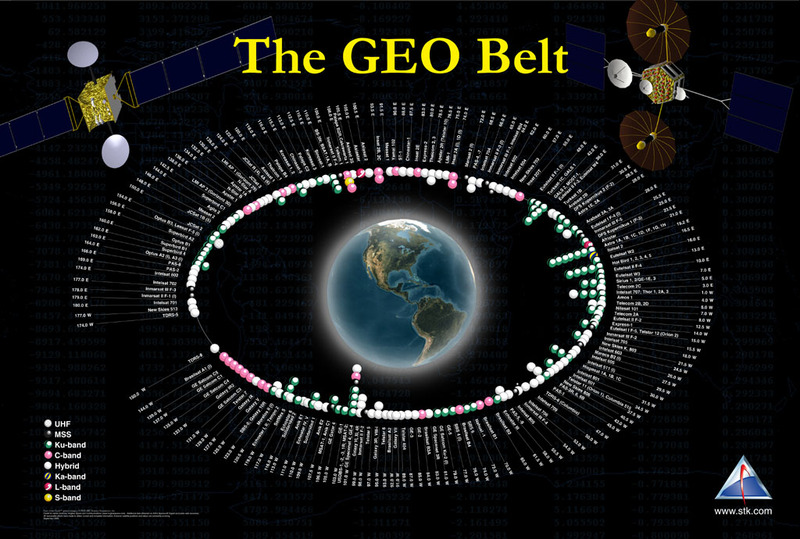 For example, Eric Johnston publishes on a SatSig.net page a list of satellites in Geostationary Orbit (GEO) that was last updated on 21 Feb 2014, so fairly recent. I couldn't find more complete list, but this individual has been upkeeping the list for a fairly long time (some older pages where he collated these lists of GEO satellites go as far back as 2004). I wouldn't know how complete this list is and I can imagine how some of the satellites wouldn't make it there and their orbits being classified, but the total number of satellites on the list is 414 (the page says 416 but an import to a spreadsheet actually comes out with two in minus, wherever they've gone?). Going by that number of listed satellites (414), and being utterly simplistic about their orbits calculating only theoretical minimum satellite separation by longitude, that on average separates them by 0.87° (or 52'10") and at distance of 42,164 km (26,199 mi) from the center of the Earth, that puts them at an average distance of 440 km (273 mi). With a bit of data import wizardry (I've prepared this fixed column width file to make it easier), the minimum distance listed is only 0.0014576° (or merely 5.25") between Astra 2C (catalog number 01025A) and Astra 1KR (06012A) that were both at longitude of 19.2° East in 2006-2007 and 2010-2013. Astra 2C is now slotted 28.2° East. With fairly similar inclination between each other (0.083 and 0.089°respectively), those simplistic maths of mine from before make more sense now and we can calculate that they were during those two time periods at the minimum distance to each other at roughly 1.1 km (0.666 mi). Note that some of these satellites are separated from each other by as little as one tenth of a degree longitude. While that may seem like very little separation, and it is, at geosynchronous altitude (nearly 36,000 km), this corresponds to an inter-satellite spacing of approximately 73 km. The major consideration for spacing of geostationary satellites is the beamwidth at-orbit of uplink transmitters, which is primarily a factor of the size and stability of the uplink dish, as well as what frequencies the satellite's transponders receive; satellites with discontiguous frequency allocations can be much closer together. The primary purposes of the IADC are to exchange information on space debris research activities between member space agencies, to facilitate opportunities for cooperation in space debris research, to review the progress of ongoing cooperative activities, and to identify debris mitigation options. The 12 IADC member agencies include: ASI (Agenzia Spaziale Italiana), CNES (Centre National d'Etudes Spatiales), CNSA (China National Space Administration), CSA (Canadian Space Agency), DLR (German Aerospace Center), ESA (European Space Agency), ISRO (Indian Space Research Organisation), JAXA (Japan Aerospace Exploration Agency), NASA (National Aeronautics and Space Administration), ROSCOSMOS (Russian Federal Space Agency) SSAU (State Space Agency of Ukraine), and UKSpace (UK Space Agency). IADC website publishes a public Document Registration List with many documents detailing agreed on procedures in place to control GEO/GSO satellite attitudes, their minimum separation, re-orbiting, disposal in higher orbits and so on and @user16653 has already mentioned in another answer a few of these procedures that the 12 member agencies agreed to respect, and to give you one additional example, the Reorbit Procedure for GEO Preservation (PDF) demonstrates well enough that even simple procedures like re-orbiting of satellites are quite complicated in a bid to avoid any issues with other GEO/GSO orbited satellites, avoiding collisions with orbital debris, interference with other satellite frequency ranges, and so on. Satellite operators' own wish to have a certain longitude slot always populated with a properly functioning satellite doesn't make this any easier either. I.e. the dynamics of these processes are fairly complicated. In theory, GEO locations are subdivided into fixed "slots" of 2 degrees longitude (or 1470km of orbital extent per slot). Within a slot, the individual satellite must confine itself to a "box" of 0.1 degrees longitude (or something like 70km). Naturally, this is not always a case in reality. Satellites do drift across slot boundaries every now and then. There's also an issue of uncontrolled debris (there's more debris fragments than working satellites). And, finally, there exist an interesting procedure of "handover", whereupon a new satellite is expected to replace an existing aging satellite in the same slot, but without causing any service interruption (so the old and new satellite must co-exist for some time in roughly the same orbital locality). Some satellite operators intentionally locate more than one satellite in a single orbital slot. They employ a stationkeeping strategy to keep them physically separated. Minimum distances of a few kilometers are usual. What kind of liquid propulsion systems do GEO satellites use? At which point would two GSO/GEO satellites with similar orbital elements be closest to each other? At what magnitude would adjacent large geostationary communications satellites see each other? How big (broad) is GEO orbit? How long does it take for a satellite to reach GEO? If we build a space elevator from Earth surface to GEO, could I step off it at GEO and remain in GEO? How many dead sats near GEO? How do communication satellites remain positioned above a particular region? What is the process for allocating GEO slots to commercial satellites? For which applications are LEO and GEO substitutable? Are commercial communications satellites in GEO being constantly monitored by telescopes? How are co-located satellites positioned relative to each other?